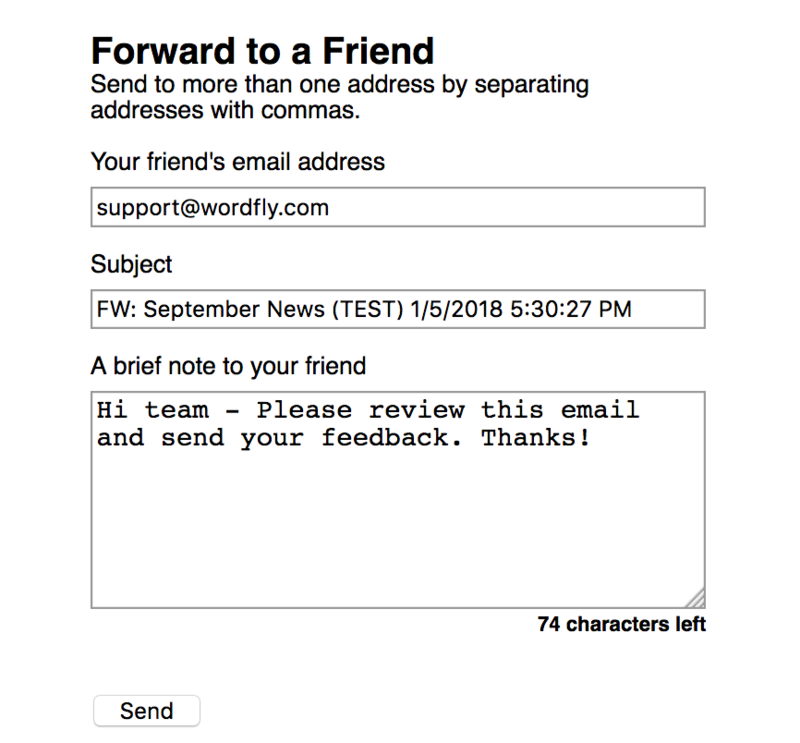 Use WordFly’s Forward to a Friend feature to add a quick note to test emails that are being reviewed by stakeholders. Forward to a Friend is a dynamic link in your email design that allows a subscriber to send a version of their email onto another recipient. A quick note can be added to the top of the Forward email to let the recipient know why they are receiving it. This is a great feature for testing emails internally. Use the Forward link to send the email onto a group of stakeholders with a quick message stating testing notes for what to review. 1. Add Forward to a Friend to your email design. 2. Save your email design. 3. Click on the Testing tab of your email campaign. 4. Select Send a test email. 5.Send a test email to yourself first. 6.Open the email in your inbox, click on the Forward to a Friend link. 7. Include a short note in the Forward to a Friend page and click Send. You might include a quick message here to your stakeholders asking for feedback. Recipients will receive a version of the test email you received with your short message.